For the top two looks, I used the following polishes. I then added a topper to my middle finger and pinky finger just for some more swag!! 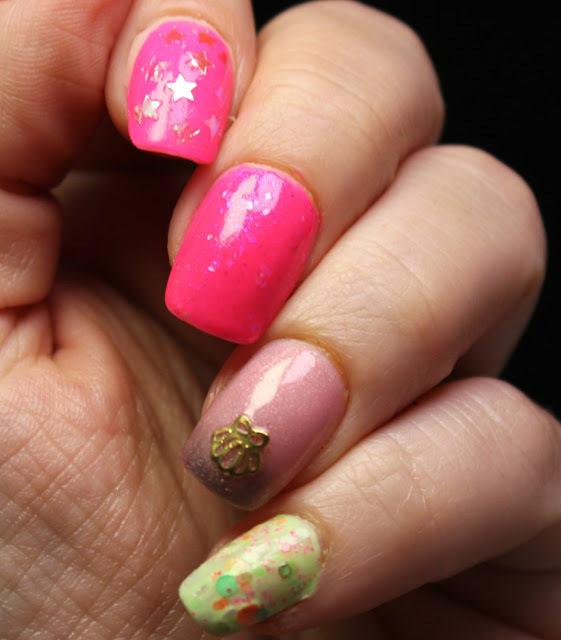 As you can see, I added a little seashell charm on my ring finger and then some iridescent stars on my pointer finger. I love both of the looks and I actually wish I would have done a look with a matte top coat, too. The MidWest Lacquer (on my ring finger) is a thermal so I have been playing with that for the last couple of days. Warm is a light pin and cold is a dark purple. Both have a holo scattered throughout. Also, I was so excited to find my Sour Skittle and then immediately disappointed to see how chunky it became. I look at my other Jindies and there are a few that have just chunked up. I am going to try to revive them because Jindie was my go-to for crellys. What do you think of this look? Do you own any Jindie Nail polishes? Did they get chunky, too? Would you have left this on for a week at the beach or would you have changed out for a solid with a glitter topper? Anyway, stay tuned on the Snap for my week long shenanigans at the beach!